Hey Kids! Want to Meet My Big Dogs? Here Are 7 Rules. Sherman and Leroy are gentle giants. However, children who want to approach them must follow a few rules. Photos by Jennifer Costello. 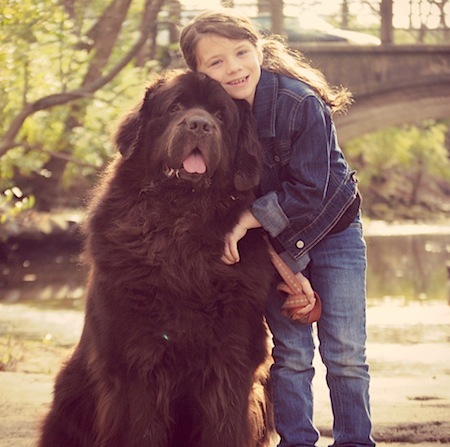 I have giant dogs and small kids, so straight from the beginning it was super important to guide my children to live happily and safely with dogs that easily outweigh them by almost 100 pounds. Some things they picked up with no problem, but other things they learned on their own. For instance, my daughter learned the hard way that when a big dog is on a mission, you need to step to the side or you’re going to get knocked over. Even though I told her this countless times, she needed to experience it herself to get the message. Well, I’ve seen my daughter race before. She tries to get out front, which is not a good idea to begin with, but it’s especially not a good when she’s racing a dog three times her size. I think she’s learned her lesson now. Experiencing things for themselves is the way some kids learn best, and that’s fine when they’re my kids and my dogs — but when it’s my dogs and someone else’s kids, I would rather it not go down that way. 1. 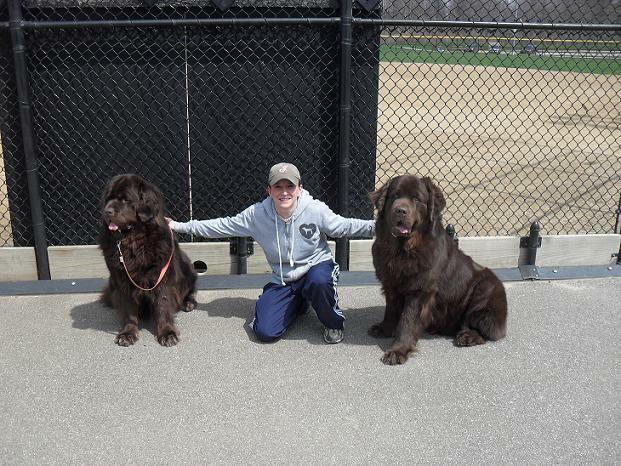 No RunningKids see my Newfoundlands as big brown teddy bears, so they come bounding toward us. If I see children running full force at one of my dogs, I tell them to stop and walk up to us slowly. I try to explain how running toward a dog can scare them, especially if they aren’t paying attention. 2. Be QuietSince I have kids, we go to a lot of kid-related functions outside. Most children are out releasing their energy, which is great — except when they are standing in front of my dogs and me. I simply ask that they tone it down for a few minutes so the dogs feel more comfortable with them. 3. One at a Time, PleaseWe usually attract a crowd; therefore, it’s important that only one or two children pet the dogs at a time so that they don’t get overwhelmed. 4. Keep Your Face AwayI don’t know what it is, but kids always want to put their teeny faces right in front of my dogs’ faces and have a conversation with them. It drives me crazy. Not because I think my dogs are going to bite them, but because there is some other dog out there somewhere who will bite them if they do this. So if I can tell them why this is a bad idea, with any luck they will hear me and avoid a future incident. 5. Ask PermissionIt’s important to teach children to ask permission to pet a dog. Some dogs may not like to be petted, and some dogs might have certain areas they don’t like being touched. And some pet owners, like me, like to be able to put their dog in a sit position before the meeting begins. 6. Stand to the SideYou can see how large Sherman is in this picture with my daughter, Gracie. Some people may disagree with me on this one, yet I’ve found that this approach works better with very large dogs. I have kids put their hands out for the dogs to sniff and then stand to the side of them. Most young kids are smaller or at eye level with my dogs, so I feel if they are standing on the side of the dogs this is less threatening to both the dog and the child. Don’t Miss: 4-Minute Pet Health Quiz — How Many Can You Get Right? 7. Don’t Touch Body PartsMy dogs are big and fluffy, and kids want to touch them everywhere, but I ask that they keep the main touching to the dogs’ torso area and stay away from the ears, mouth, legs and tail. Given that one of my dogs, Leroy, has suffered from major ear infections in the past, he’s not fond of his ears being messed with. I try to spare him the agony of someone tugging on his ears by directing their touch. My dogs are great with kids, but sometimes kids aren’t so great with them. I’m a firm believer that teaching children how to safely approach large dogs — or any size dog — should be taught at home by their parents. Unfortunately that doesn’t always seem to be the case, so the least I can do is provide a bit of education while I’m out with my family and my dogs. Sorry, kids: My dogs, my rules.